Eversharp Skyline standard size fountain pen from the 1940s. Uncommon version with Wahl clip and Wahl nib. Lever filler, navy blue body, cap, and derby with gold plated trim. 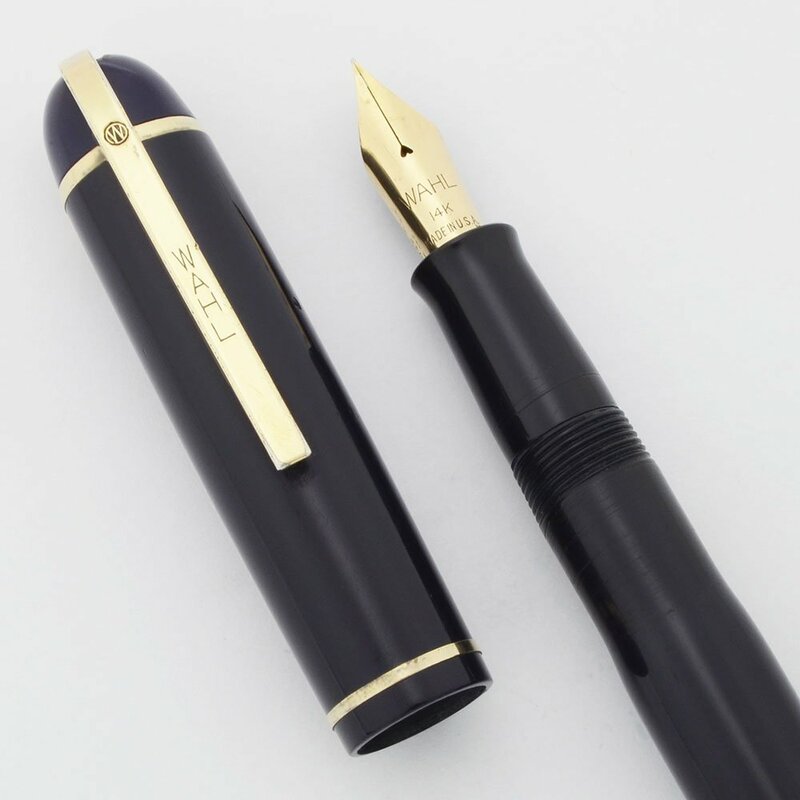 Flexible extra fine 14k gold Wahl nib. Excellent condition, fully restored and working very well. Product Name Skyline. This is an uncommon version with a clip marked "Wahl" and a nib also marked "Wahl." 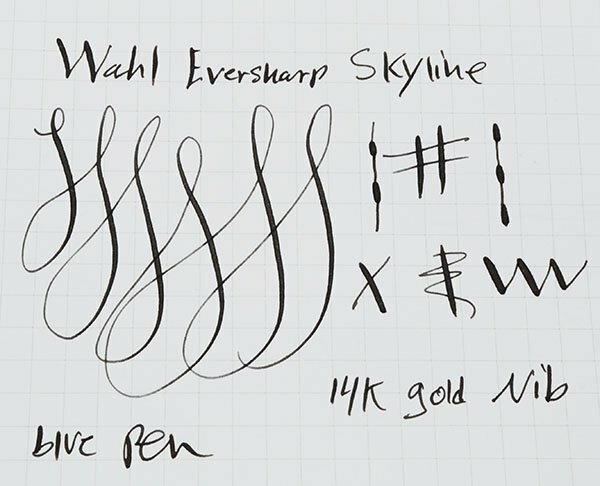 There's some conjecture that these Wahl branded Skylines were produced in order to maintain the Wahl tradename. Manufacturer and Year Eversharp, made in U.S.A. -- 1940s. Color Deep, dark navy blue barrel, cap, and derby, with gold plated trim. Thin cap band. Nib FLEXIBLE EXTRA FINE Wahl14k gold nib is smooth with nice tipping material. You need a light hand with these extra fines. See writing sample below. Condition Excellent condition. The pen looks shiny though there are fine scratches. The end of the barrel has some bite marks. The derby top of the cap has some marks and scratches. The clip has some brassing on the edges and a nick on the right side near the W in Wahl. The other trim pieces have scratching but they are shiny. Because of the deep, dark blue color (more like navy blue), many of these flaws are not visible to the eye. No cracks or personalization. The imprints are clear.